There’s nothing Winnie loves more than taking to her broomstick for a nice relaxing flight. But lately the skies are chock-a-block with all kinds of flying machines! After several near misses and a few bumpy mid-air crashes, Winnie decides it’s time to use a little magic! 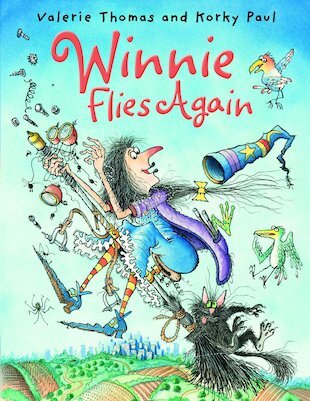 But when her efforts to turn her broomstick into a bicycle, a skateboard and a horse lead to disaster, can a bruised and bedraggled Winnie find a safe way to travel – by looking no further than the end of her nose? Winnie keeps crashing into things and she gets new things to ride on. The pictures are funny.